Clydesdale Western 1st XI sealed a place in the Women’s Grand Play-Off Final for a third season running after an inspiring display – which included three goals inside the first twenty two minutes – saw off a stirring comeback from Dundee Wanderers at a boisterous rain soaked Titwood last Saturday. An unerring start from ‘Dale Western saw them race to a 3-0 lead just past the opening twenty minute mark thanks to goals from Naomi Harkness, Emma McGregor and captain Frances Lonergan. Wanderers responded just short of half time from the spot before adding another two goals fifteen minutes into the second half to throw the contest very much in the air. But the home side found their first half finishing touch when Harkness added a second to her name, before Ali Eadie sealed the win from the spot with ten minutes to go. The result means the L1s qualify for the Women’s Grand Play-Off Final, where they will play Western Wildcats on Saturday 13th April at Glasgow Green from 2.00pm. In a game that coincided with a number of Play-Off games around Scotland, ‘Dale Western could not have wished for a better start against the side who effectively ended their Women’s National Division One ambitions seven days prior to their Semi Final Play-Off contest. Three minutes were in when a quick piece of thinking when taking a free hit just short of the final 25 saw the ball played into Millie Steiger right of the baseline before setting up McGregor who had her initial shot saved. The rebound fell back to McGregor who unselfishly teed up Harkness at the back post with the simple task of tapping in to open the scoring. The home side stepped up their intentions and were quickly rewarded with a second goal. The award of a corner saw the ball switched left for a Julie Lonergan sweep that was deflected by a forward off the goalkeeper’s helmet and in the air. Fortunately for the L1s, McGregor – who had moved towards goal following her injection duties – was on hand to slam home the loose airborne ball into the goal. ‘Dale Western made it three when Frances Lonergan smashed home a corner in the twenty second minute. Wanderers responded not long before half time, when a short corner attempt was stopped by a home side foot on the line, which resulted in the awarding of a penalty flick. The flick was duly dispatched emphatically in to the top corner for 3-1 and kept the contest alive. Despite the best efforts of a noisy Titwood support, it was the away side who did all the cheering not once but twice in fifteen second half minutes, responding to a three goal deficit in stunning style to level proceedings and set up a grandstand finish. The second goal saw a scrimmage in the ‘Dale Western circle break for a Dundonian forward left of the baseline to lift past ‘keeper Jessica Buchanan. The L1s should have scored a fourth after a Heather Lang pass found Harkness near the penalty spot. But despite the away side’s goalkeeper being out of the goal, the opportunity for Harkness was amazingly missed. And they were made to pay after a loose piece of possession inside their own 25 saw the home side picked off with one pass into a Wanderers forward, right of the circle, to slot past Buchanan again. Harkness thankfully made amends for her open goal miss, after a pass in the D reached Lang. Unable to get a shot away, the Scotland capped forward layed the ball off to Harkness towards the left hand side of the baseline, who lifted in the goal for 4-3. And with ten minutes to play, the home side were awarded a flick of their own – for the same offence as the one they were penalised with earlier – which was converted by Ali Eadie. Clydesdale Western went on to see out the remaining ten minutes of the contest to secure their place in next weekend’s Final, where they will face Western Wildcats – who beat WNL 1 champions Edinburgh University 1-0 in the coinciding Semi Final. In the rest of Saturday’s games, the L2s and L3s finished their league seasons with wins, whilst the M3s also collected three points. The M3s found themselves in all kinds of disarray, 2-0 down at half time to Glasgow University 2s at Titwood. But David Henderson’s inventive under the arm finish at an angle from Colin Moulson’s pass triggered a comeback. Henderson added a second ten minutes later, before his short corner attempt five minutes towards the end found its way to Ian King who swept home to give the M3s a 3-2 win. However, the M4s and M5s had tough games in Men’s West District Two and Three respectively. The M4s went down 10-0 away to Rottenrow 2s, whilst the M5s lost 7-1 at Auchenhowie to Western Wildcats 4s, despite being a goal ahead through Sebastian Chastin. 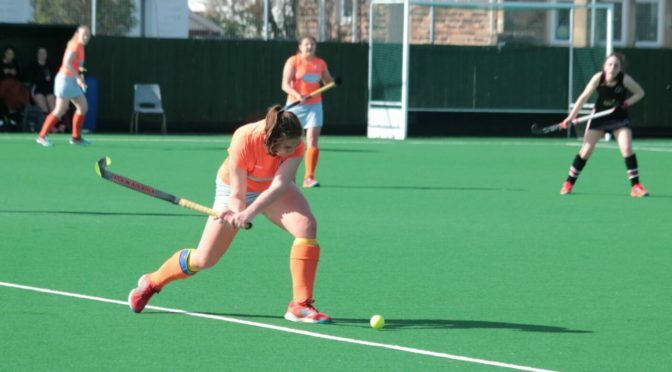 The L2s and L3s secured second and fourth place finishes in Women’s Championship Division One after wins against Watsonians 2s and Waverley Inveresk Trinity 1s respectively. The L2s took three points following their 2-1 win against Watsonians 2s at Tipperlinn, despite being a goal down. A goal each from Lucy Arnold and Annabelle Ballantyne meant the L2s – who had a matchday squad featuring two debutants in Elise Fitzgerald and Alessia Martinolli – finished second in Championship One’s league table this season. The L3s took maximum points in a superb performance that gave them a 6-2 win at home to Waverley Inveresk Trinity 1s. Superb team moves saw Rachel Whittle score two from close range early on before veterans Helen Walker and Gill Green added to the L3s first half tally, despite Waverley scoring a goal in between the third and fourth home goal. The away side scored another but the comeback was over when Green added a second from the spot. The L3s put the icing on the cake after a superb move featuring Walker, Green and player of the match Anna Winter, resulted with a goal for Iona Denholm, who tapped in to make it a 6-2 final score line.